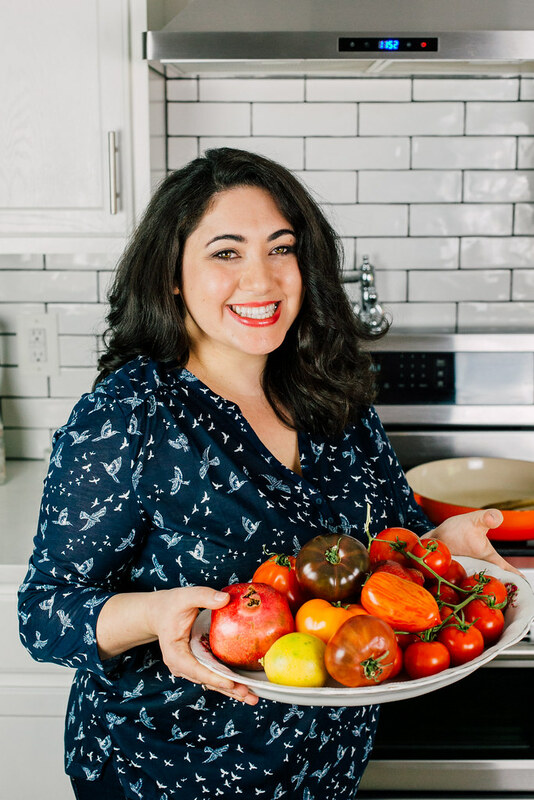 I have been dreaming of making a vegetarian stuffed grape leaves for months now. Not that my mom’s classic stuffed grape leaves aren’t perfect (which they are!). I grew up on eating the families simplified version with as little as 3 ingredients (not including lemon slices and water). There was never any measuring really and the rice not cooked, but the meat and rice mixture with the briney grape leaves always came out perfect. So perfect that our childhood friends in Brooklyn still talk about my mom’s famous grape leaves. I have to admit, I even felt a bit guilty thinking of another recipe! I mean, how could I? How do you fix something that’s already perfect! You don’t, instead, you create something different! 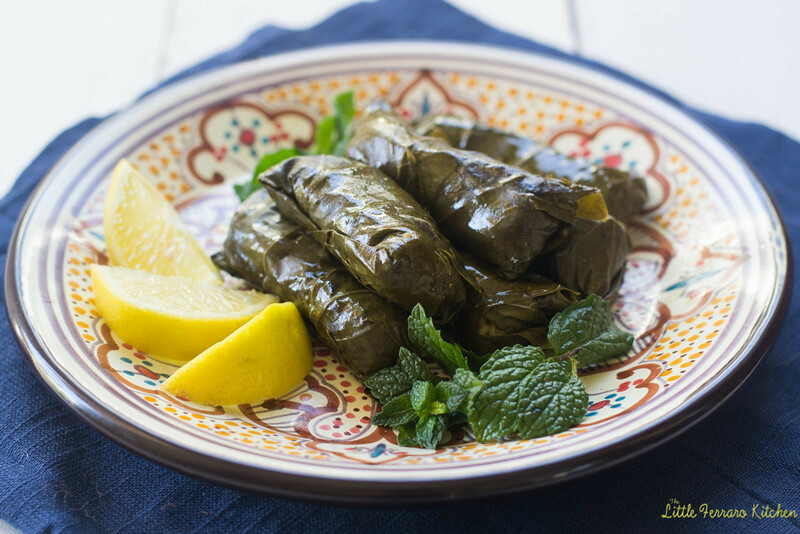 These gorgeous vegetarian grape leaves can really be called vegan too! Loaded with basmati rice, fresh mint and dill, chickpeas and grated tomato. I par-cooked the rice just to help get things going. Unlike my mom’s meat grape leaves, she puts the rice in uncooked leaving the juicy meat to add moisture. But with the vegetarian mixture, it needs a little more of a helping hand. To see how I roll grape leaves, please check out my mom’s stuffed grape leaves! First rinse the grape leaves. They come tightly packed in a jar. Gently remove the leaves and rinse them well in a colander under cold water. Separate the leaves carefully and rinse well. Allow to drain in colander while you make the filling. In a food processor, add the garbanzo beans and pulse a bit to get a crumbly texture and there are no whole beans. Set aside. In a large skillet with high sides, saute the chopped onion in olive oil for about 5 minutes until the onions becomes translucent. Then add the basmati rice and toss a bit with the olive oil to coat, for about another minute. Use a grater to grate the tomato. This gives you all the tomato juice but none of the skin. Add the grated tomato pulp to the rice mixture and toss to mix through. Then add all the herbs, the dried mint and fresh mint, parsley and dill. Add the garbanzo beans, emon zest and juice and season with salt and pepper. Add the vegetable stock and mix in. Cover the pan and cook until the liquid has evaporated, about 10 minutes. You don't want to cook the rice fully, just par cook it. Taste for seasoning. When done, allow mixture to cool slightly. Then set up your working station. Have the mixture close, your grape leaves and a large pot to cook the grape leaves. Line the bottom with any torn leaves and a few lemon slices. 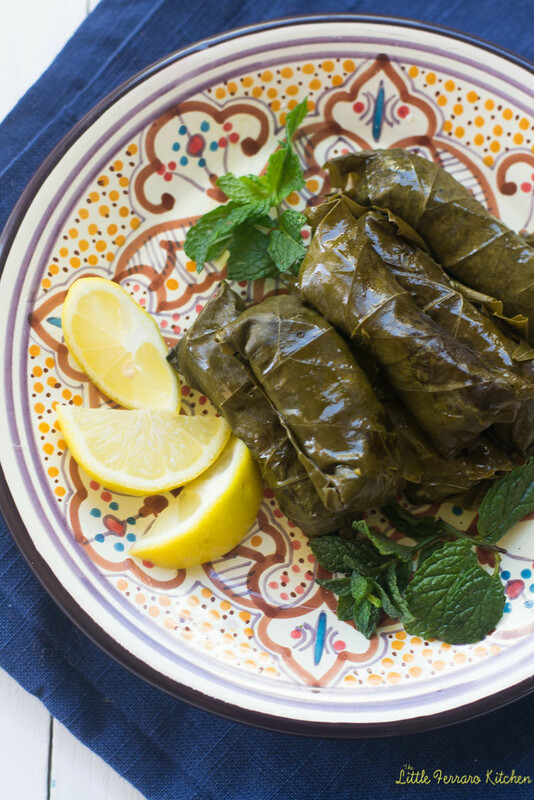 To roll grape leaves, lay 1 leaf flat with the dull side facing you. Remove the little stem. Place a small teaspoon amount of the mixture towards the bottom of the leave. Then roll half way up, tucking the sides in (just like a burrito) and then finish rolling. Place the grape leaf seam side down into your pot and finish rolling the rest. You also don't want to overfill because the rice expands. (You may have mixture left over, depending on how many leaves you use). 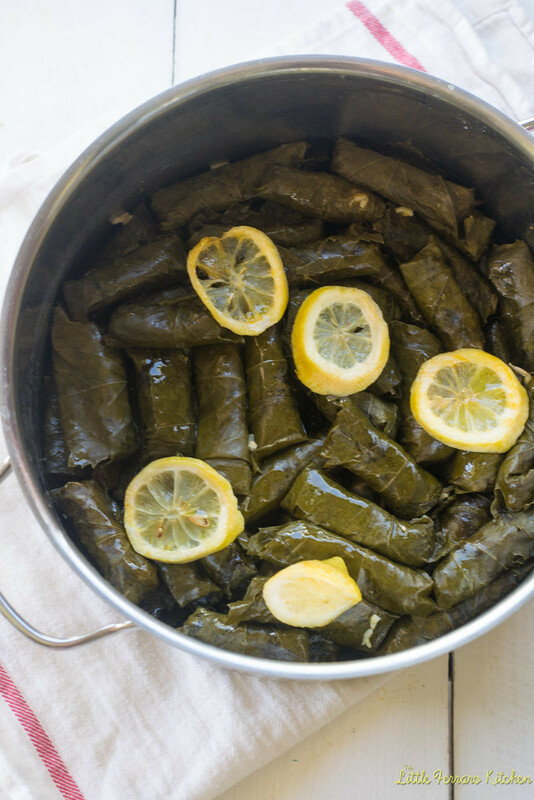 Once all the stuffed grape leaves are rolled, top with leftover torn leaves and lemon slices. Add 2 cups of water and cook on low for about 45 minutes. You don't want to cook them too fast. Then taste to see if the rice is fully cooked. To serve, add a squeeze of lemon juice if you'd like. I was a little aggravated that I pulsed the garbanzo beans, set them aside as directed, and then no instruction was given to add them to the mix. I added them with the herbs. The flavor is great, and can easily be made stronger or modified. Next time I will buy 2 jars of grape leaves for the amount of filling. Your recipe seems like it will fit the bill with my sons’ vegan girlfriends. My family are all meat eaters and going to a fourth of July party, I don’t want to single them out by just bringing salad. Why do you use Dill? Hi Cathy! So sorry for the delayed reply….I love the addition of dill with all the other flavors that can be a bit bland (rice and chickpeas). I find the dill brightens the others flavors up nicely! And also i suggest you to use meat or animals meat then it will be better ? Oh yes I have a recipe with meat and rice inside. Thats how my mom taught me to make it originally! Thank you for the comment!